Hello friends, I am back again with another project for Christmas. 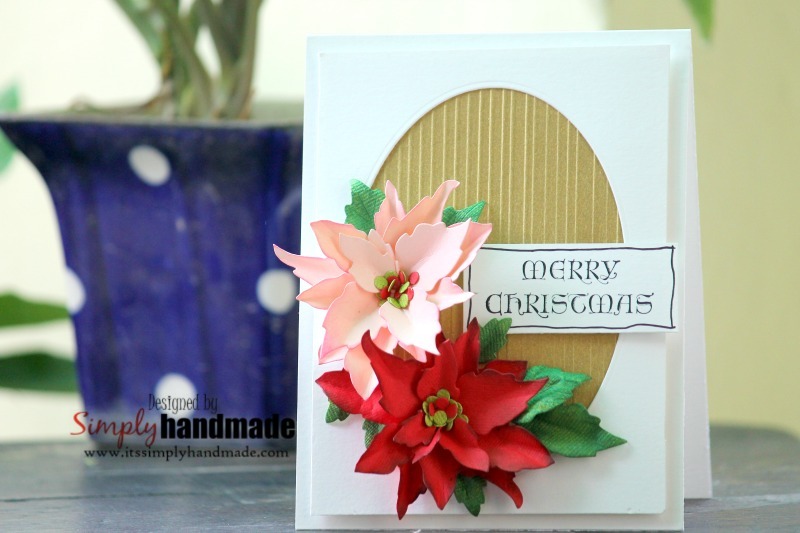 This time I am featuring the Poinsettia along with some basic and elegant background. Its a beautiful concept to get all your Christmas cards get created at this time of the year. So by Christmas all are cards and gifts are ready to go. 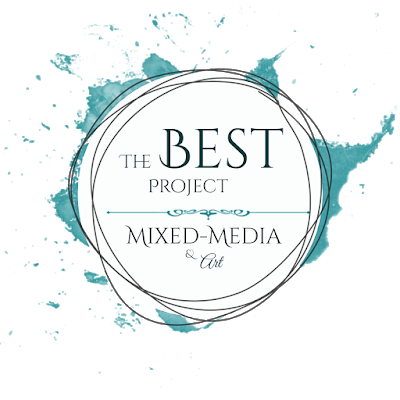 Do share how you like it and would love to hear from you. Until then happy crafting. Will be back soon with some more fun creations. Welcome friends to a brand new post where we are debuting yet another collection which simply classic , elegant and unique. So that we can capture our memories better in a more beautiful way we have this collection beautifully made. Today I have shadow box easel card using the wedding classic collection. Instructions: Start by taking a white card stock that measure 4.25" x 11". Score on the 11" at 5.5" and 2.75" and fold along the scored lines. This will form the card easel base. Cut coordinating paper with 1/8" less than the card base and adhere to the white card easel panel. For the inside cut another piece of coordinating paper and cut at 1/8" less than 4.25" x 5.5" and adhere it inside. On four corners adhere flat base pearls and finish the inside with a sentiment cut from the paper collection. Use some foam tape to adhere the sentiment which will help the easel to stand. For the easel front panel, die cut 2 piece from the Decorative Medallion Die using the white card stock. Also die cut the outline using a coordinating paper and solid cardstock. Adhere altogether and adhere to the easel front forming a circle. Using the CBC1-456-2 Card Shadow Box Set - White fold the shadow box along the score line. Cut cordinating piece of paper and stick it to the shadow box. 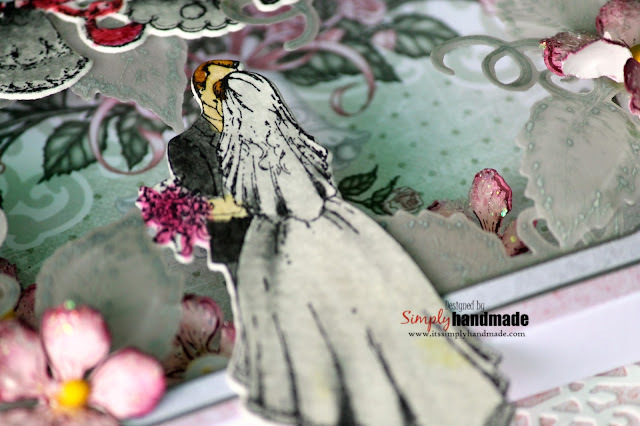 To embellish the shadow box stamp and die cut from the wedding bells stamp and die set from a water color paper. Color the images using black soot distress ink and pink archival ink. 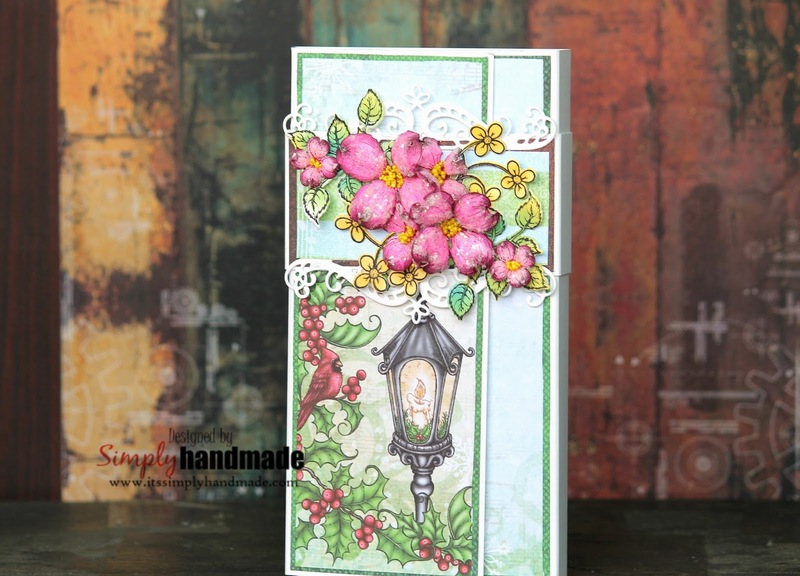 Die cut some leaves from the Botanical rose stamp set using vellum. Trim all elements and assemble them inside and also on top of the shadow box.Once the shadow box is embellished adhere it on the medallion base which in turn stick it to the easel front base. Die cut and shape some botanical rose flowers and place them on the sides to complete the easel card. 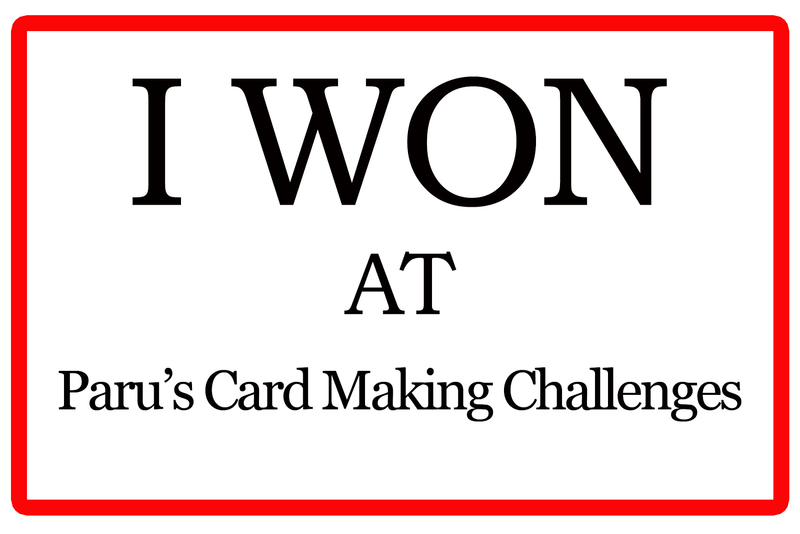 Share how you like the card and also would love to hear from you. Hello friends, here today welcoming you to a brand new post. This has been one of my favourite and enjoy it thoroughly whenever I go back to the dies to create some projects. 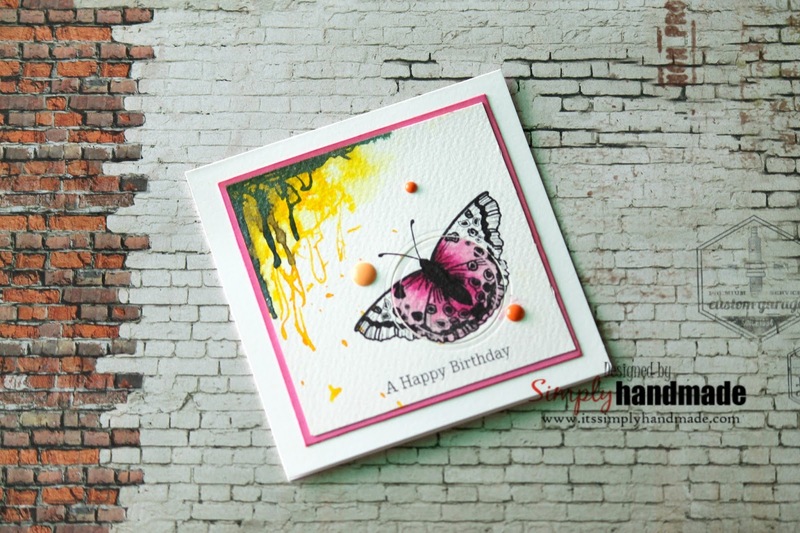 The colors are so vibrant and can be created with so many variations. Step 1: Cut and score a white card stock to measure 5.5" x 4.25"
Step 2: Cut a piece of colored card stock at 2" less than the base. 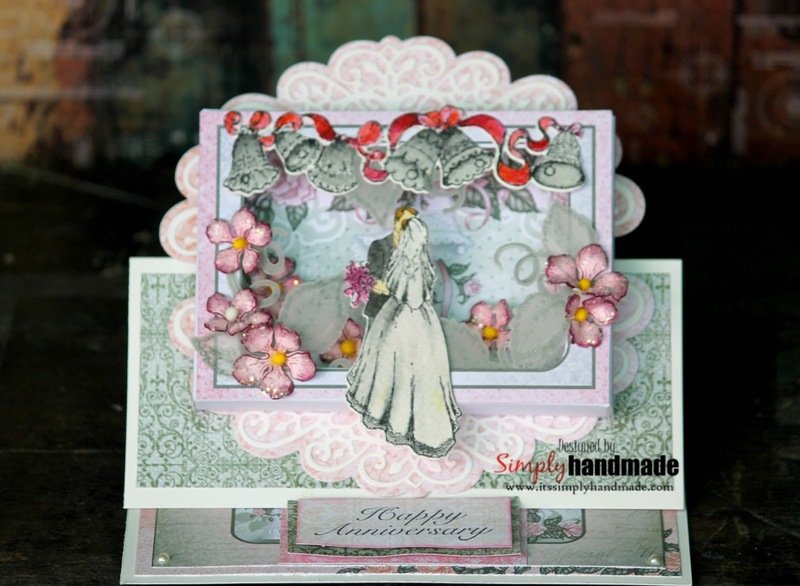 Die cut using the postage stamp rectangle die. Step 3: Die Cut another piece of white card stock at 4" less than the card base using the postage stamp rectangle die. Step 4: Die cut some pieces of entwined circle. Cut them into random pieces and adhere them to the card base. This will complete the card base. Step 5: Die cut several pieces of the hydrangea from white card stock. Shape and color them. 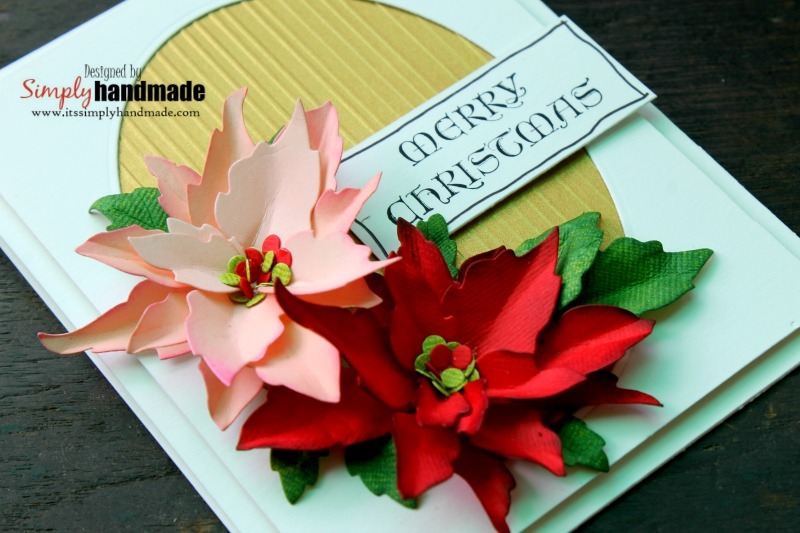 Step 6: Assemble the shaped flowers, leaves and stem on the finished card base. Step 7: Finish it with a sentiment. Thanks for stopping by! Do share how you like it and love to hear your comments. Welcome friends to another beautiful Wednesday where I have a card that captures all elements of christmas. Instructions: The final card measures 5.8" x 5.8". Take a white card stock and score it at 5.8 to form the card base.Cut a corordinating paper 1/8" less than the card base and distress the edges.Further to create the 3rd layer cut and distress 12 pieces to create the brick wall as a backdrop. Stamp and die cut multiple pieces of holly berry leaves and color them using zig clean brushes. Later using some glossy accents and frosting powder glitter all the leaves and berries. Die cut 2 pieces of oval with 1/8th inch difference from the paper collection. Distress all the edges and using foam glue dots adhere them on the card panel. Later assemble all the leaves and berries tucked in on the card panel. 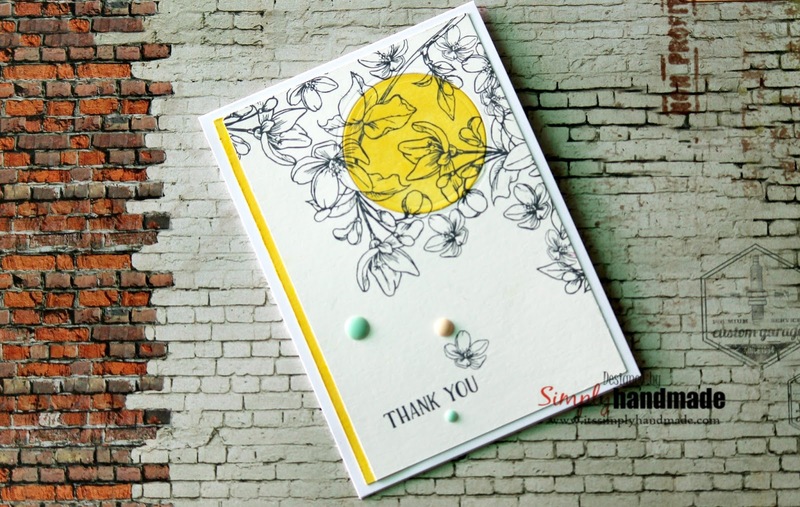 Finish the card with the sentiment from the paper collection. Thanks for stopping by! have a lovely day. Love to hear from you! A very good morning to a happy bright Sunday! 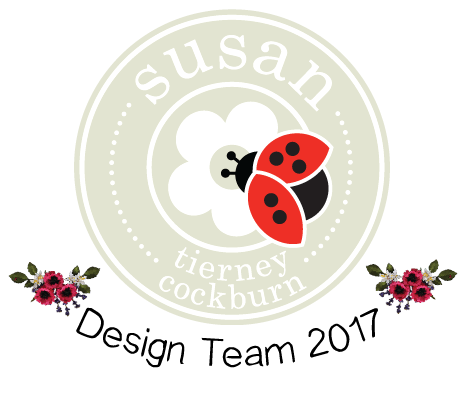 Welcome all my readers to another post where I create with Susan's Flower dies. Working with sunflower has been one of my most enjoyable moment and that too always. The bright color, vibrance and its largeness has always captures me. Today I have a semi mixed media ( if i may name so) canvas featuring the sunflower. 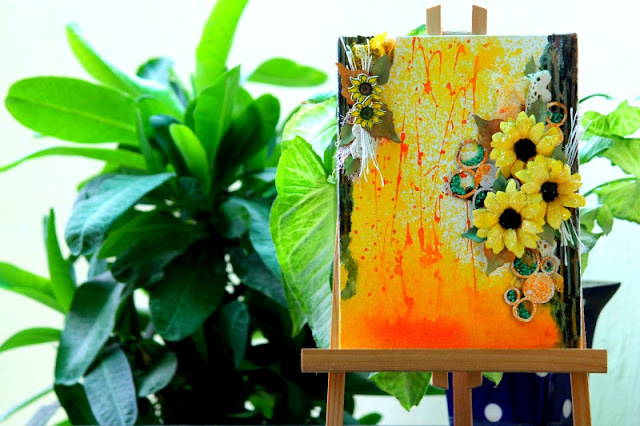 The canvas is prepared by a thin layer of Gesso on which all the coloring and the texturing is created. Later the bouquet is assembled. I would love to hear from you! 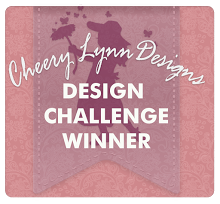 Thanks for stopping by and soon will be back with some more fun creative projects. 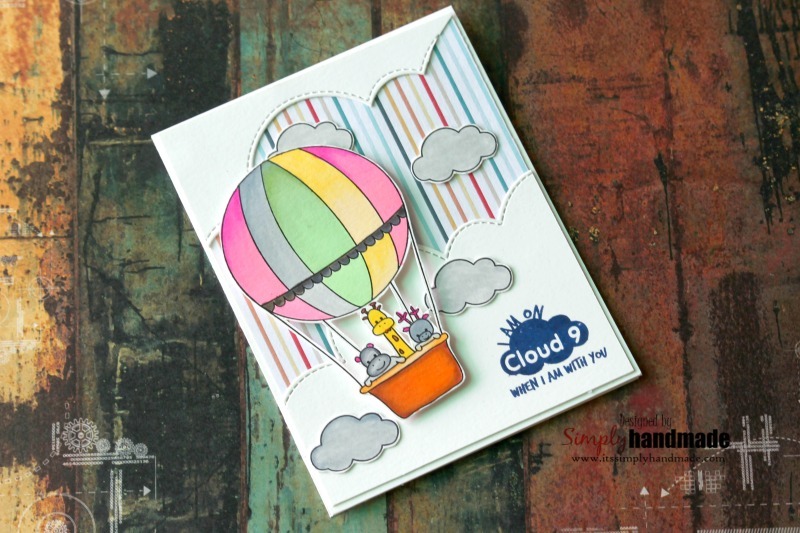 Hello friends, welcoming to another post with some some fun cards, coloring, fussy cutting and background stamping. 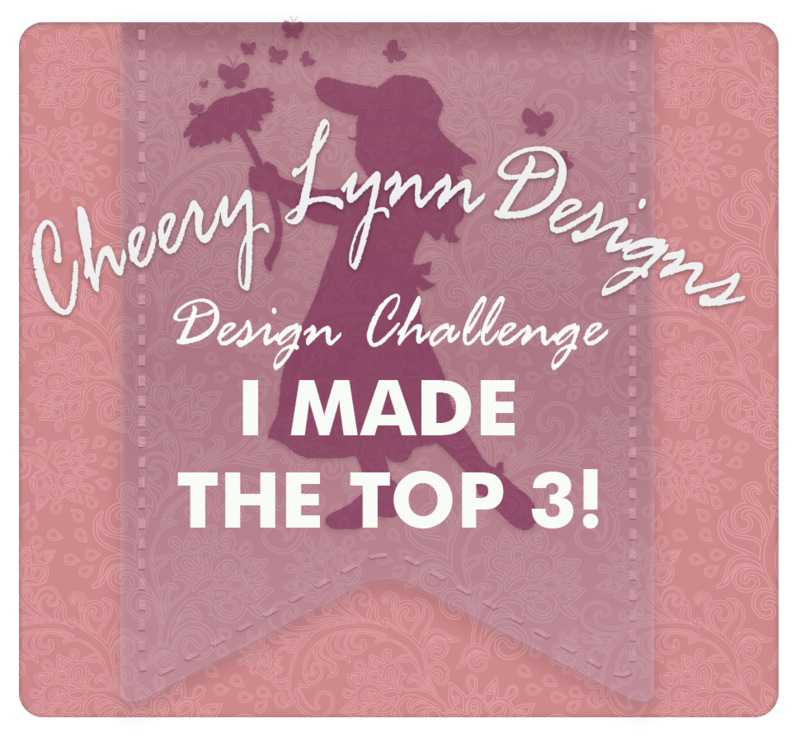 I have 3 cards today to share with you all. I have used most of the new release and enjoyed thoroughly working on them. Love to hear from you. Thanks for stopping by! Welcome friends, its another Happy Wednesday at Heartfelt Creation. We all are having fun creating Christmas Cards, decoration , gifts and so much, how about you. Today I made a lovely set of a card and Chocolate Box . I kept it coordinating so it will be easier and fun also to gift it together. The Card measures 5.8" x 5.8" and the Chocolate holder measures 6.5" x 8". 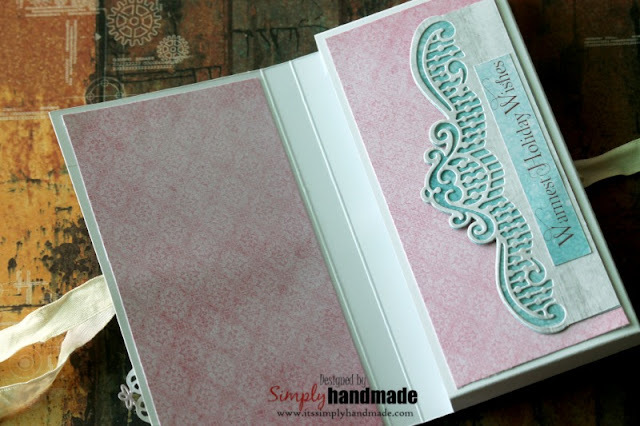 Card : Take a white card stock and score it as 5.8 to create a square card base. Use a coordinating paper from the collection and cut it at 2" less and adhere it to the card base.Take a card panel from the paper collection, trim it at further 2 inch less and then adhere to the card base. 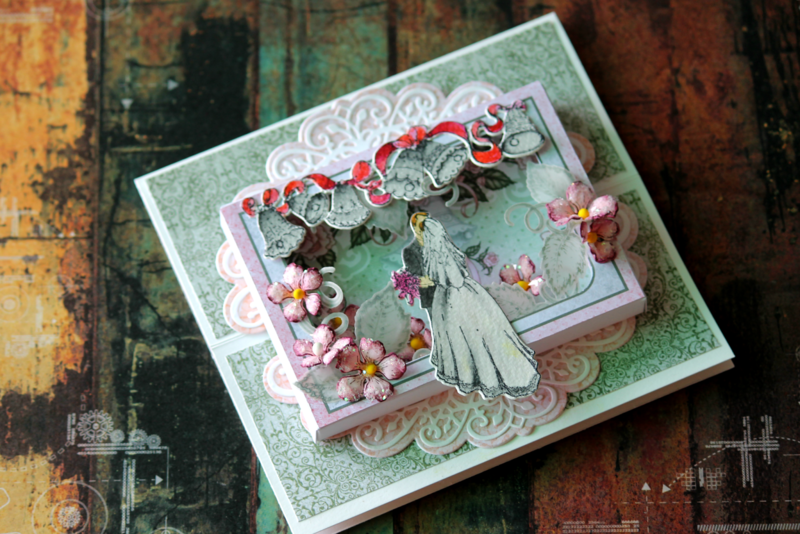 For the embellishment die cut the decorative lace die from the die set. 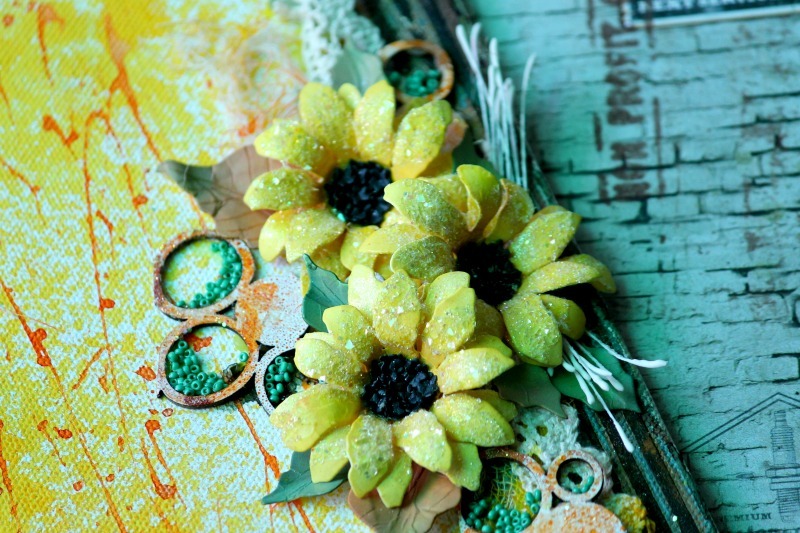 Die cut some window filler flowers and heat set with frosting powder. To finish the card assemble all the die cut pieces along with some hand shaped flowers from the sun kissed fleur. Chocolate Box: Take a white CS which measures 8" x 6.5". On the longer side score it 3.5",4" from both the ends.On the shorter side score it at 7" , 7.5".Fold at all the score lines , cut coordinating paper from the paper collection with 2" less than the panel.Adhere all cut paper and then assemble similar embellishment as like the card on the chocolate holder base. 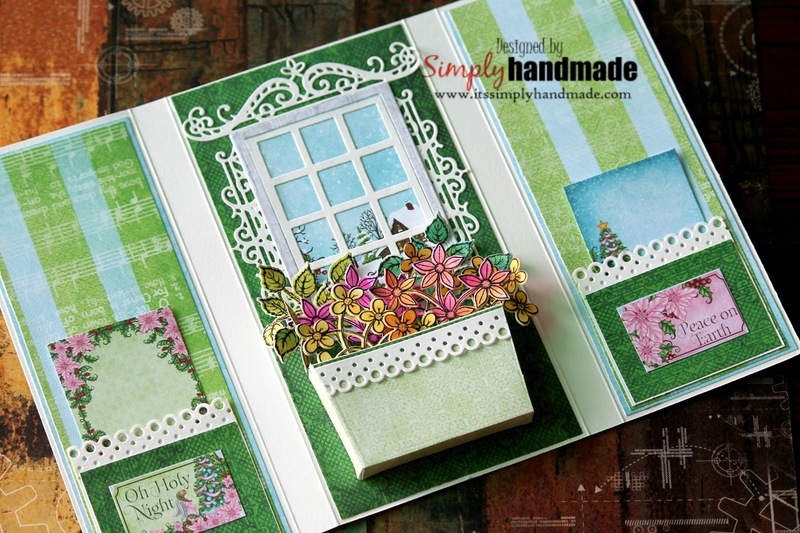 Window Box Fillers Cling Stamp Set : HCPC-3795 ; Window Box Elements Die , Window Box Fillers Die , Winter's Eve Paper Collection , Ribbon , Frosting powder , glue gun , clear adhesive , White Card Stock. Do share your comments and also what you create with the Winter's Eve Collection. Love to hear from you. Happy Crafting until then and see you soon! Welcome once again for a bright , eventful Wednesday! 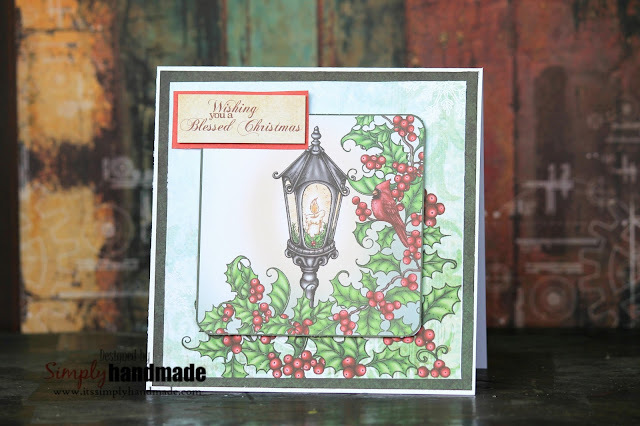 Yes its the second Wednesday and here at Heartfelt we are debuting the Winter's Eve Collection. How fun is it that we get to celebrate Christmas , winter and snow twice a year. This collection will remind us to sit beside our window and experience the snow fall , the sledge that just passes by. We also get to witness the little wild flowers that finds its way in mid of the heavy snow. Lets welcome this collection and here's what I have for you. The final card measures 7.5" x 4". 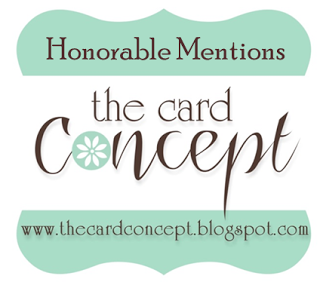 Take a white card stock that measures 11" x 4". Score at 3" and 3.5" to create the folds. Cut 3 pieces of co coordinating card stock from the paper collection. For the side panel cut it at 4" x 7.5" and for the center cut it as 3" x 7.5".For the second layer cut 3 pieces of the coordinating paper at 1/8" less. Adhere all the co coordinating paper onto the white cardstock. 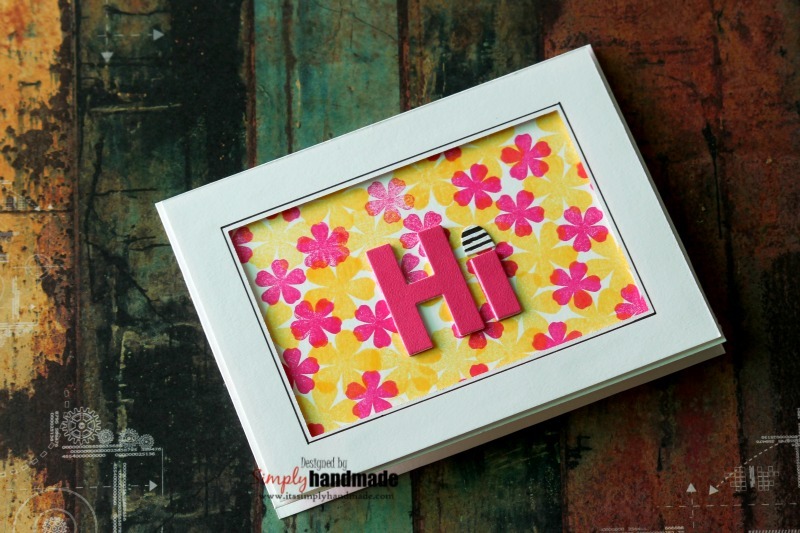 For the window frame, using white card stock die cut all the pieces and place them on the center piece. 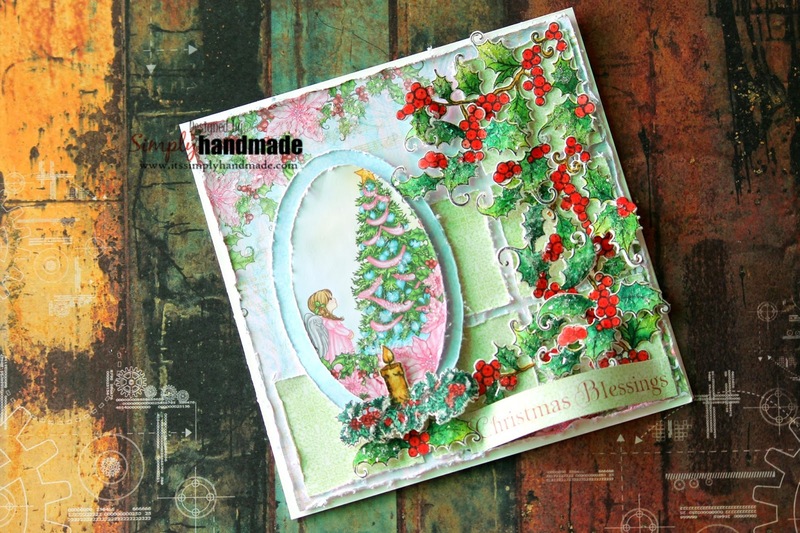 For the basket, use the co coordinating die from the HCD1-7150 Window Box Elements Die and the co coordinating paper.Also on the side panels die cut the decorative edge and create pockets to hold the sentiments or piece of journalling. Using archival black ink stamp and die cut many pieces from the HCPC -3795 Window Box Fillers Stamp Set. Using Pine needles, Crushed Olive , Vibrant Fuschia and Sunflower AI, color all the filler leaves and flowers. Once all colored place and assemble them in the basket. To close the tri fold card create a belly band that measures 2.5" x 11" and score it at 3" and 3.5". 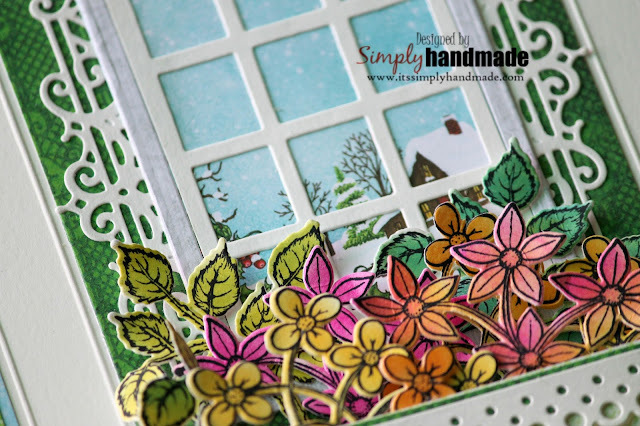 Use a co ordinating paper to embellish the band along with die cut pieces from the window frame set for the edge. Decorate the band using some handshaped dogwood flowers. Would love to see your comments and love. Let me know how you like it. Good Morning friends, welcome once again to a very interesting post. Its interesting cause I have never made this kind of a card before and also the kind of dies used. We have a whole new range of cottages, frames, window dies at Elizabeth Craft Designs Store. They have all the detailed pieces to create your own cottage or country side. So when I received the dies, I wondered what can I use this for. Something one can relate to and definitely stays meaningful. 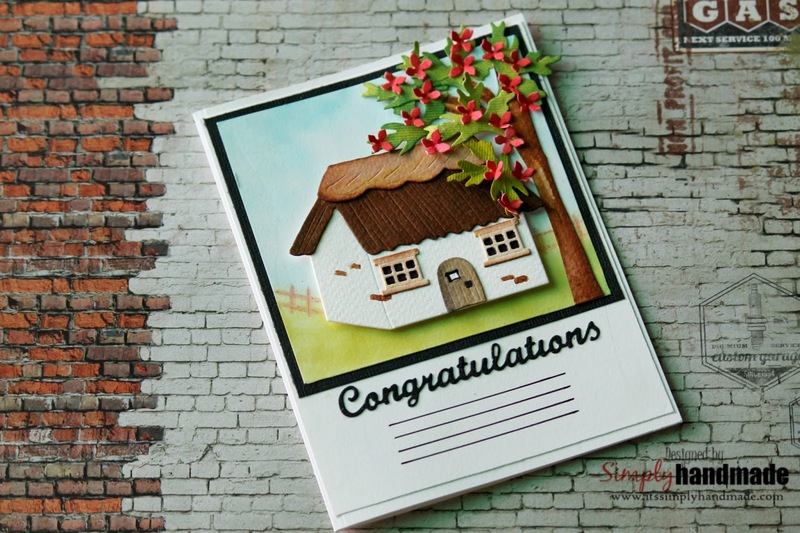 Here;s what I thought of, how about a House Warming Card. 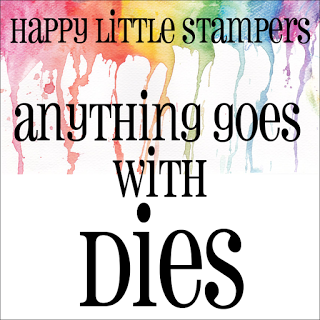 These dies fits perfect with the occasion and a must celebration for all. Die cut all the pieces of the Cottage die using a water color card stock. Later using distress ink, colored all the elements. This card is a little taller as I wanted to keep space at the bottom for the name and date. For the tree fussy cut tree trunk and colored using distress ink. On a soft finish cardstock mix some shades of Crushed Olive and Broken China distress ink for the background. Assembled the house on a piece of foam and then places the tree. Placed the panel on the base card for the final card. 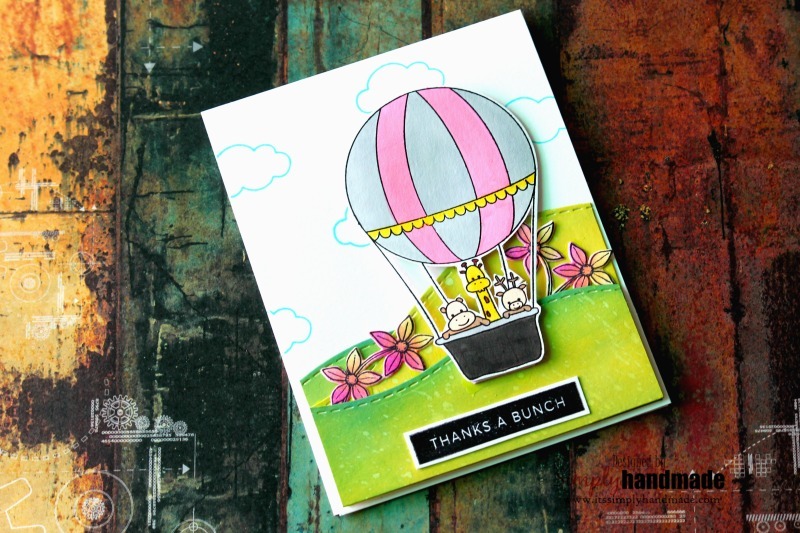 Die cut the word Congratulations on a black Card Stock and then stick it at the bottom. Love to know how you liked it. Untill then Happy Crafting, see you soon! Hello friends, while we are still celebrating Christmas here in at Heartfelt Christmas, I have another simple card to wish Christmas for your friends and Family. This card I designed keeping it mail friendly as more than often we have to send our cards via courier and sometime the 3D layered cards becomes a challenge. Its a card I made within 30 minutes considering the papers so versatile. The paper pack has all the sentiments and wishes you can wish for Christmas hence it makes all the more easier. Other Products: Dimensional adhesive, scissors, Scoreboard , Kraft Knife , foam , Glossy Accents. Instructions: The card measures 5.5 x 5.5. It has 3 dimensional layers .Cut a white card at 11"x5.5". Score the card at 5.5" on the 11" side and then fold the card which forms the card base. From the Festive Holly paper stack cut a paper 5.3"x5.3" and then adhere to the card base.For the center piece use the cut mat create 2B dies and die cut a paper from the paper collection to form the center piece.Use a piece of foam and adhere to the square center piece. Later place it as the 2nd later. For the center piece cut a sentiment from paper collection and adhere with a piece of foam layer and stick on the final card. 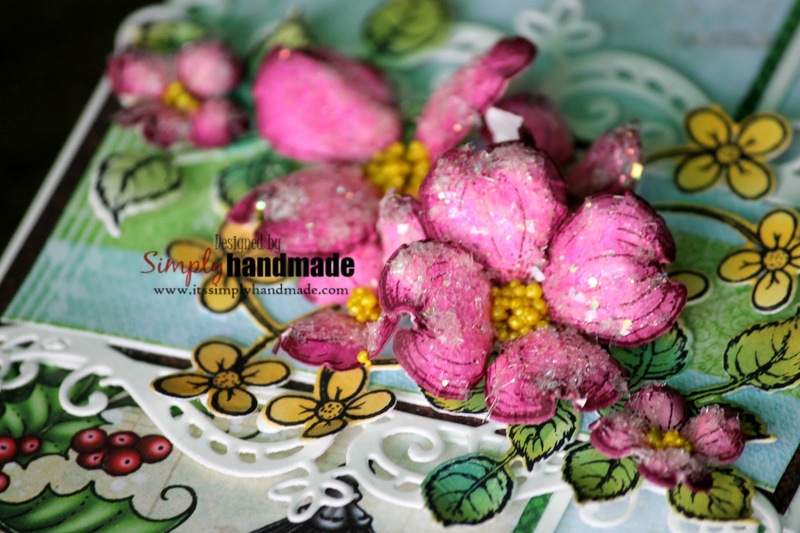 To drizzle some frosting powder randomly on some of the holly leaves using glossy accents. 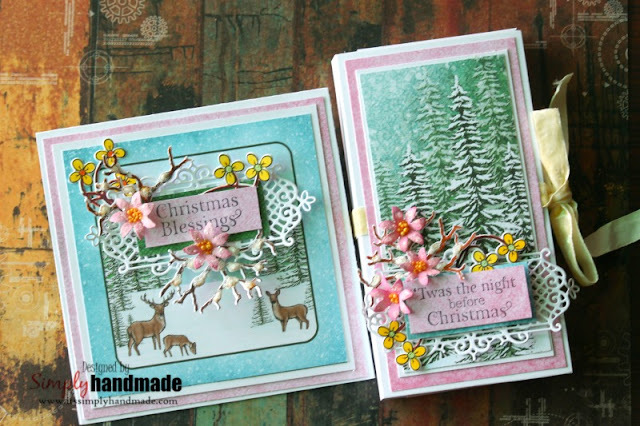 Would love to see what you create for your Christmas Cards. 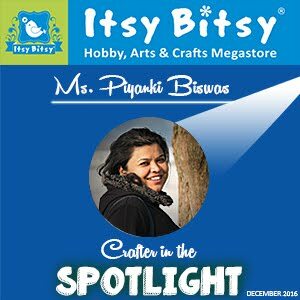 Happy Crafting, do share what you love in my projects and anything else you want me to showcase. Untill then lots of love! 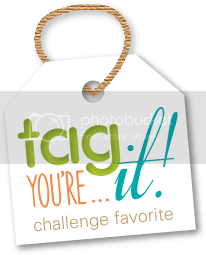 Hello Friends, Today we are playing along with this month's challenge. 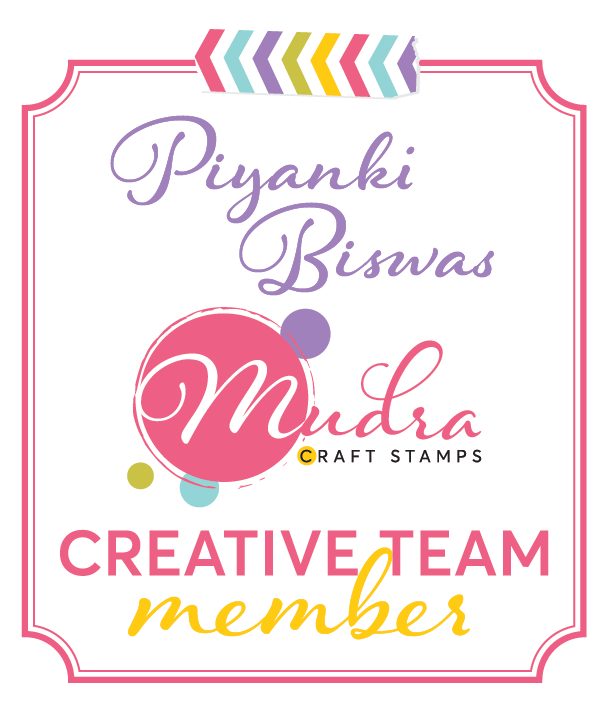 At Mudra we have a very exciting challenge that is launched this month. Spotlight Technique is a very interesting way to add some focal point to your project, or to enhance the very spot that needs attention on your projects. Here we have used the below sets for this card. Its a 4x4 note card with 3 layers. The first layer is created on a watercolor background with some color sprays. First stamp the image and then die cut the center . Using distress ink , color the center piece and then adhere to the image. For this card, stamp and repeat stamp the image. Later die cut the center piece. Using distress ink again we have colored it. Later it was adhered and placed. We would love to see what you create. Love to hear from you.